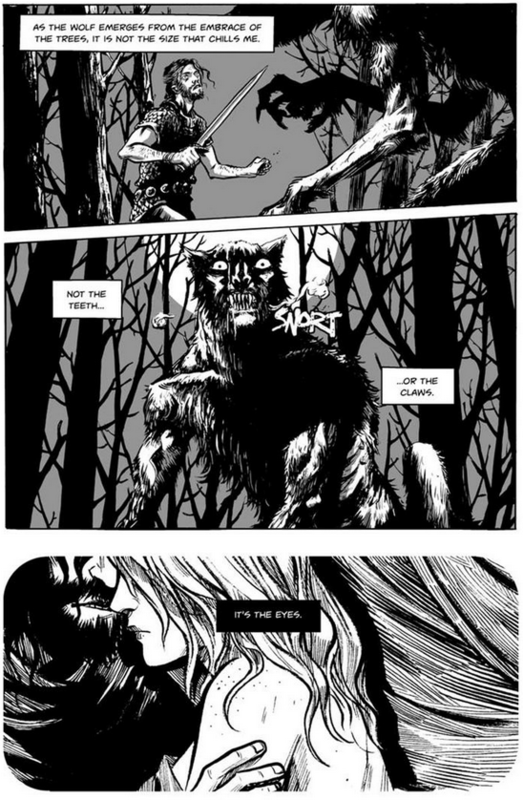 This post contains spoilers for Becky Cloonan’s comic Wolves. I suggest that you go buy the comic and read it here. It is ninety nine cents; being tax-free because of magical internet money, it actually costs less than anything else you could buy for ninety nine cents. Go buy it. The comic is a 24 page affair. It is a simple story, a fragment of a fairy tale, without a clear beginning or an end. It is a short story in the most pure sense of what that means; it begins as close to the end as possible. It places the reader in a constant memory, a looking-backward that forces us to ask the question “What happened?” and then making us feel sad and empty for finding the answer. The story itself is simple: a hunter, sent by a king, kills his own love because she is a werewolf. There are surface-level things that we can say about the story: it is about doing what has to be done and the pain that comes with it; it is about loss and how one deals with it; it is about carrying the dead with you forever, both literally and metaphorically. In any case, comics and video games both excel at putting us in event spaces shaped around memory–video games make us play them, but comics, through closure, make us insert them into our own memory. The combination of image and text puts the reader into an ethereal space where she is actually building the memory itself. 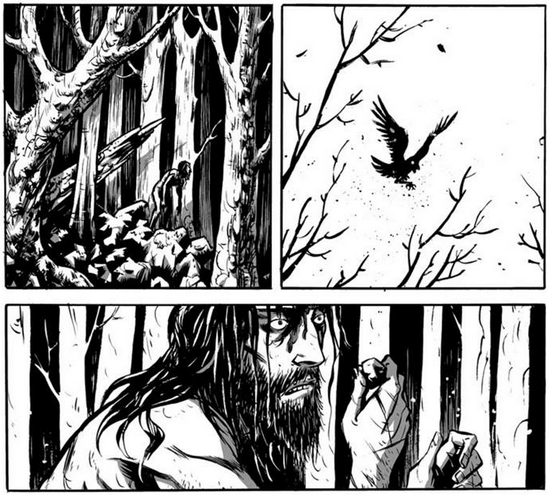 Cloonan realizes the power of comics here, and her storytelling techniques serve this memory implantation: short, declarative sentences combined with moving, ethereal images of closeness and comfort jar against repeated shots of blades and violence. I think this page is one of the most beautiful I have ever seen in the comics medium. The top panel is separated from the middle by a slightly diagonal line–it signals that things are abnormal, that this is not a normal hunt, but something more terrible. The werewolf’s eyes, wide and staring at us from the center of the page, draw us into them. The use of white and black there is pure genius work. The whiteness of the moon, like a halo, contrasts with the black face; from inside the face, the eyes gaze out. The third panel drives it home with the inverted colors of the text box and the obscuring of the eyes of both male and female. It is important to notice that the first two panels are a memory and the third is a memory-inside-a-memory. The reader is creating the chronology of the first two panels-there is a man and a quick cut to a monster who is dominating both the man and the page. But the third panel forces the reader into an act of memory; on the previous pages, what did her eyes look like? When I read the page, I thought hard, and couldn’t remember, even though it was mere seconds since I had read the previous pages of the comic. Both the memory of the character and the memory of the reader is drawn into question, and complicity, with the comic. I think that is beautiful and brilliant. So read Wolves. It costs as much as half a cup of coffee or a bag of Cheetos. This entry was posted in Comics and tagged becky cloonan, comics, complicity, memory, video games. Bookmark the permalink.